Full Frontal show runner Jo Miller on taking inspiration from political anger. Since Jon Stewart signed off from The Daily Show, it has been openly pondered who would step into his shoes and "articulate rage" for a new generation of frustrated young people. Samantha Bee, originally from Toronto, is beginning to feel like the antidote to Stewart's absence. 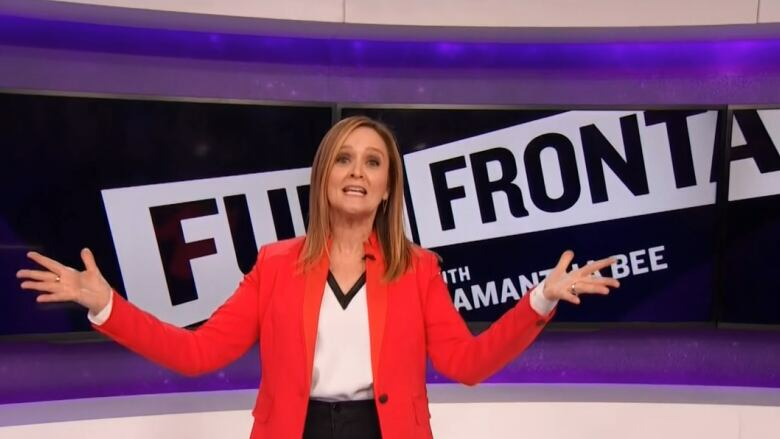 Bee hosts the late night political comedy show Full Frontal which has been called, "exasperated fury, rattled off in as many insults and exhortations as Bee can pack into a single breath." Showrunner Jo Miller sees the program as a vehicle for her, Bee and the rest of the shows producers to express their own political anger. Miller describes the anger she felt, specifically about the now infamous Donald Trump and Billy Bush tape, as "physical, in the pit of your stomach," but by processing that feeling through jokes and expressing that anger she finds some sort of satisfaction. So what's the secret to being a "surrogate of the voiceless?" Believing deeply in the validity of your anger is the best way to get your feelings across to audiences. "If you're faking outrage, it just falls flat," says Miller. She makes the distinction between the destructive anger of twitter trolls and the constructive anger she hopes Full Frontal is a part of. "It's an if you see something, say something, see something anger."